Your seats at the Hugh Hodgson School of Music's finest performances are just a few clicks away! Subscriptions are available for purchase from now until July 27th. Click the following link to subscribe for an entire season's worth of concerts. Proceeds from Thursday Scholarship Series subscriptions directly support student scholarships. There is also an option to 'Create Your Own' Season if you follow the link below. Click here to purchase your 2018-2019 Thursday Scholarship Series subscription online! 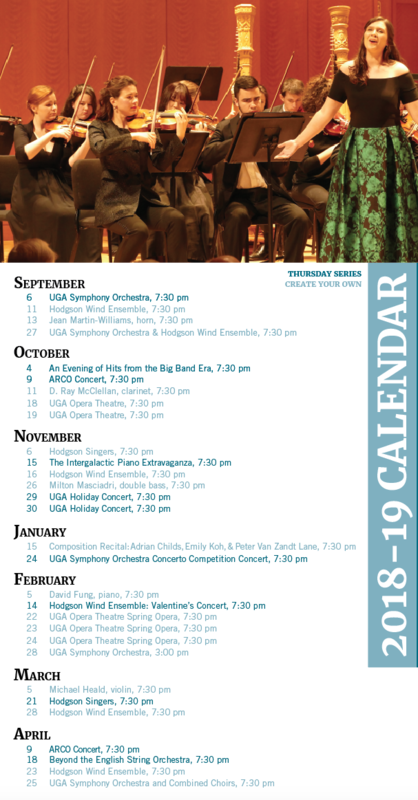 To download the 2018-2019 calendar, click here. We look forward to seeing you in Hodgson Hall on September 6th for the start of the 2018/2019 Season! Tickets to individual Hodgson School events will be available starting August 20th!